In the process of surrendering to Albuquerque police on March 16, 2014, James Boyd, a homeless and mentally ill man, was attacked by a police dog and shot in the back. Boyd was sleeping in the foothills of the Sandia Mountains on the city’s eastern border and considered a “direct threat” by virtue of two small knives. When one of the officers who shot Boyd had his helmet cam-video released shortly afterwards, people were angered and saddened by this murder.1 The video went viral on YouTube, registering over a million hits. Organizations that have long been protesting police brutality— including LULAC, ANSWER, the MLK memorial, Albuquerque Task force for Public Safety, and the Albuquerque Peace and Justice Center—reached out to Boyd’s family and organized a march of over 1,000 just nine days later on March 25. They temporarily took over the front of the police department, from which family members denounced Boyd’s brutal killing. Following this impressive demonstration, Anonymous (the “hactivist” network) called another protest for March 30. They committed themselves to disrupting APD’s virtual communications network, including its website and Facebook pages. On that day, more than 500 mostly young people took over historic Route 66, the main boulevard through Albuquerque. Composed of mostly working class youth, these Hispanic, Latino, Native American, Black, and white protestors were angry, militant, and peaceful. Their march began at APD headquarters, where protesters were met with a militarized force in full riot gear, some with assault rifles, tanks, and other armored vehicles. Thus, the march began with a police confrontation. Experienced activists, many from (un)Occupy Albuquerque, were able to de-escalate the situation by urging protestors to march to the University of New Mexico area. For over 10 hours, protesters effectively and non-violently disrupted business as usual, even temporarily taking over the interstate highway that runs above the downtown area. The APD, the Bernalillo County Sheriff’s Office, the National Guard, and police forces from other cities gathered over the course of the long protest. As soon as they calculated that enough protesters had gone home, they launched a coordinated tear gas attack. Much of the gas spread to the surrounding businesses and UNM dormitory areas, catapulting the issue of APD’s brutality onto the national and international stage. A community forum of over 175 people was held two nights later. Participants developed a wide-ranging list of issues, addressing the need for decriminalization of poor and/or mentally ill people as well as demilitarization of the police. The discussion included calls to improve social services for the mentally ill, poor and homeless, ending the school-to-prison pipeline, and recalling Albuquerque Mayor Richard Berry. After two hours, they agreed to boil everything down to three demands: 1) release all lapel and helmet cam-videos of police shootings since 2010, 2) indict the officers involved in the Boyd killing, and 3) drop all charges against the six protestors arrested on March 30. Since 2010, the Albuquerque Police Department have shot and killed 23 men, the majority of them homeless and/or mentally ill. 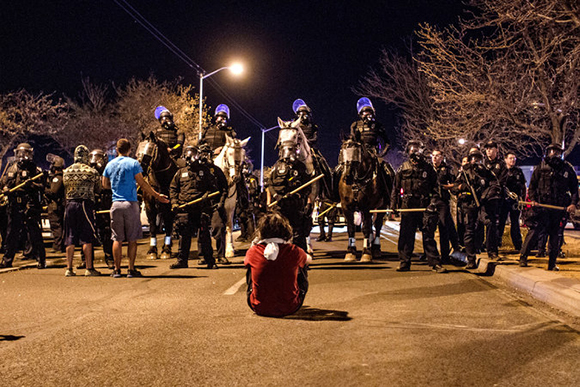 This “war on the poor” is a part of New Mexican history, with the majority of police killings taking place in Albuquerque, but by no means confined to this part of the state. At the time of the Boyd shooting, a number of organizations had already been waiting on the outcome of an 18-month Department of Justice (DOJ) investigation of these many other shootings. Hoping to contain further protests after the March events, Mayor Berry called on the DOJ to release their report. He also spun a narrative of how mobs in the streets created “mayhem,” by committing such hideous crimes as spray painting a police substation and temporarily blocking traffic, while lauding the “professionalism” of the police department. For the most part, the local and national media picked up and ran with this framing of the March 30 protest. The Mayor did not take responsibility for the 23 people killed by the police department he oversees and continues to support. In fact, Berry had just hired Police Chief Eden, who, upon releasing the Boyd video, called the murder a “justified” killing. Other elected officials have also been busy covering up and justifying police brutality. Albuquerque District Attorney Kari Brandenburg convened grand juries on most of the 23 killings, but every one was ruled justified. Governor Susana Martinez limited herself to calling for an investigation of only the Boyd shooting. State Attorney General Gary King met with some of the anti-police brutality coalition members, commenting that each police killing should be investigated and stipulating that, in the worst cases, there could be charges—but one is left wondering what the “worst cases” are and what charges those police officers might face. King is also chair of the board of the New Mexico Law Enforcement Training Academy, where he has evidently failed to promote an approach to law enforcement that values civil liberties. David Correia, a leader in the Albuquerque Task Force for Public Safety and independent journalist, points out after a rash of APD shootings in the 1980s, police training was reformed and standards were raised.2 As a result, shootings declined–but by the 1990s, another concentrated period of killings of mostly poor people of color followed. In response, a Police Oversight Committee was formed, but this minor reform has proven ineffective. Instead of this committee, which focuses on targeting a few police officers who are “bad apples,” Correia argues that what is needed is a civilian oversight committee with the authority to hire, fire, and discipline police. The report illustrated the APD’s especially egregious use of force in killing of Kenneth Ellis III, a young veteran of the Iraq War who suffered from post-traumatic stress disorder. He was shot and killed by an APD officer while Ellis, suicidal, held a gun to his own head. The Ellis family sued the city for the killing of their son and reached a tentative agreement with the City of Albuquerque for $8 million. The DOJ report also addresses the prevalent use of force against mentally ill people, but does not suggest decriminalizing mental illness, homelessness, or poverty. New Mexico is the poorest state in the nation, with over 22% of the population living in poverty. It is this reality, according to Correia, that has exacerbated police aggression. The three demands hammered out at the meeting following the March 30 police attack have come to the foreground as the slogans around which most organizing is taking place. These demands have been raised in subsequent demonstrations, whether called by Anonymous or by the local coalition. They have been raised at meetings coalition members have held with the mayor, high-level APD officers, the district attorney, and the attorney general over the last few weeks. At a five-hour City Council meeting held on April 7, hundreds testified about the need to end police brutality, many bringing up the three demands. However, with the exception of only one city council member and the attorney general, no other elected officials have stated they will pursue even two of the three demands. 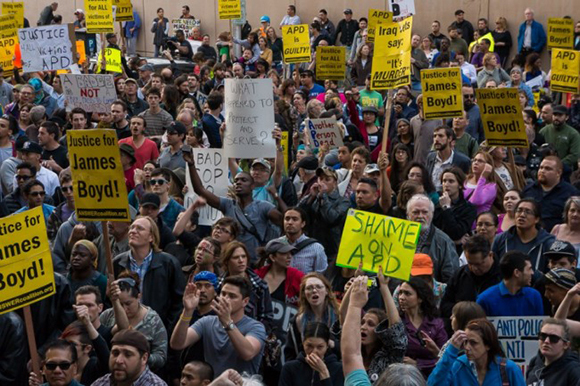 Many residents of Albuquerque, who have been brutalized by the APD or stand in solidarity with those who have, will continue to organize and protest in the streets, in the ballot boxes, and in the courts to ensure the DOJ holds the APD accountable, that the three demands are met, and that there will be no more James Boyds. But beyond the three demands and an end to police brutality is a deeper movement for social justice. Bill Bradley is a community activist and union organizer, and has lived in Albuquerque for nine years. He was a leader in the Occupy movement. David Correia’s online journal La Jicarita has been covering the anti-police brutality struggle in great detail, http://lajicarita.wordpress.com/ He is also a professor at UNM and author of “Properties of Violence: Law and Land Grant Struggle in Northern NM” a comprehensive book that includes history of police-led violence against rural poor people’s movements. The 14 demands can be found in this article: http://lajicarita.wordpress.com/2014/03/25/apd-shoots-and-kills-james-boyd-its-23rd-victim-since-2010-march-on-downtown-scheduled-for-tonight/. Quotes taken from interview of David Correia on Insight NM, at http://newmexicomercury.com/blog/comments/insight_new_mexico_david_correia_on_apd.